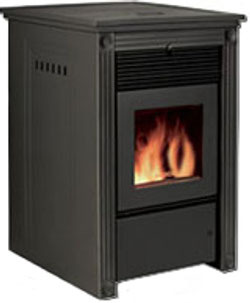 The Bosca Classic 500 freestanding pellet stove is the Bosca Spirit in a very different casing. This enabled Bosca to increase the hopper capacity by 50% to 65 lbs.. Able to heat areas of from 15,000 to 18,000 square feet, the "Classic" is capable of 40,000 btu., but can run for 86 hours on low without re-filling the hopper. It is a radically different design from the ultra modern 'Spirit' and the classical looks wouldn't be out of place in a grand fireplace from the 1760's. The Bosca Classic also has an enlarged easily accessible ash pan to increase the interval at which ash needs to be removed. Heating Area 1,500 to 1,800 sq. ft.
Min. Heat Output 8,200 btu. Convection Blower Capacity Varies according to feed rate, has a high volume over-ride switch. 160 cfm. Window Size 10.25 in by 10.25 in. Rear Vent Height 17.6 in. Seven years for all Pellet Stoves, and limited labor for the first 2 years to the original purchaser. This warranty covers: firebox, heat exchanger, burn pot, firebox panels, ceramic glass, panels and door assembly. Three years: burn pot liner against defects in material and workmanship for part, repair or replacements. Two years: all electrical components such us blowers, auger motors, igniters, wiring vacuum switches, speed controls, control boxes and thermodiscs switches. One year: all exterior surface finishes against defects in material and workmanship, for part repair or replacements and limited for the first year to the original purchaser. Feed rate and damper settings affect each other and must be adjusted manually to suit the quality of pellets and the output required. Daily: Stir the burn pot, look for clogged air holes and wipe the glass. Weekly: Empty the burn pot, clean the glass. Brush ash from the combustion chamber. Yearly, or for every ton of pellets burned: Empty the ashes, vacuum the interior exhaust chambers, clean the blades of the combustion and convection fans, clean the venting, check for air leaks around the gaskets. If you would like to leave a review of the Bosca Classic, please use the form on the Contact page.